The Pit and the Pendulum is a short story written by Edgar Allan Poe in 1842. A story this old can sometimes become lost in a sea of out-dated material that doesn’t fit into the current society ,but that cannot be said of Creation Theatre Company’s revolutionary production. Taking a classic story and not only re-telling it in a modern light, but twisting the concept of storytelling to create what can only be described as a masterpiece. By using the traditional words and narration of a classic author and pairing it with the feelings and oppression of a young Iranian Girl, Creation have achieved a piece of theatre that explodes into today’s society and leaves you wondering if there is something that you could do to help. However, this is a political piece with a difference. All too often you can leave a piece of political theatre and be exhausted by the pounding of the production pulling on your soul to get their point across. With The Pit and the Pendulum, this is achieved fairly easily and uses a lot of humour and modern references to show the issues in our society. The use of technology in this production was incredibly interesting. Getting an entire audience to wear wireless headsets for the production adds a new level to theatre. It really added to the production, and gave the impression of the voice actor being thoughts in the back of the audience's head. It had a very personal feel to it and made the production seem as if it was only being performed to an audience of one. For a production like this, that feeling is key and I applaud the technical team for this. 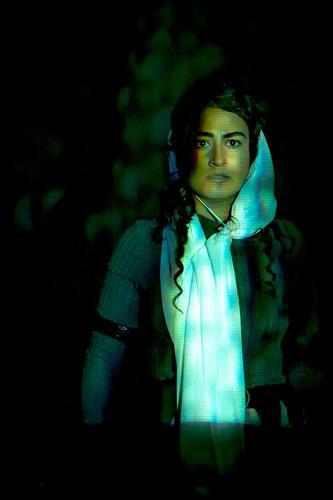 The solo actor of the production Afsaneh Dehrouyeh was simply phenomenal. Her ability to get the message out, while still providing a fantastic evening’s entertainment for her audience was astounding. The continued round of applause long after Dehrouyeh had left the performance space proved how superb her stand-alone performance was, acting against only a voice in the audience's head. The Pit and the Pendulum, written and directed exquisitely by Christopher York, is a revelation and is one not to miss.